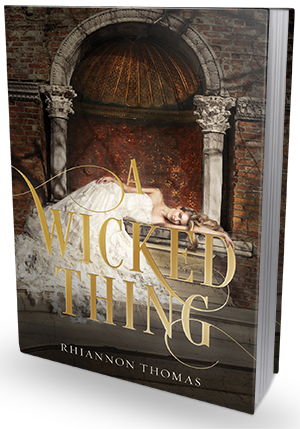 I am extremely happy and excited to be today's stop on A Wicked Thing blog tour organized by The Unofficial Addiction Book Fan Club! I absolutely LOVED this re-imagining of Sleeping Beauty and I recommend it to everyone who enjoys a well written and clever fairy tale / fantasy. A memory bubbled up, long ignored and unwelcome. Her mother, the foreign queen, brushing through Aurora's hair as she stood by the window, just tall enough to see over the ledge. Aurora had been chattering about something, about book and adventure and her impossible dreams. "I'm going to travel," she said. "Like you, mother. See everything. Everywhere." "No,dear," her mother said. "It isn't safe." Aurora craned her neck, ducking free of the tug and pull of the brush. "Not now," she said. "After." Everything had always been before and after in her head. Cursed and free. "Not even then," her mother said. "Why go far away, when you can be safe and loved with us?" Aurora stayed silent then, but she kept dreaming until the end. Planning, wishing, poring over maps and books, right up until her eighteenth birthday and the finger prick that ended it all. She had gotten her wish, she supposed. She was a story of her own now. But it was not as she had imagined. Still the rest of the world was locked away. "I thought I'd be like one of the girls in the stories," she said. "Swinging swords, fighting dragons, having adventures. But..." She stared down at the ragged old doll. "Nothing turned out as I thought.". "Does it get any easier?" she asked, after so much time had passed that she was sure he had forgotten their conversation. "No." The word fell heavy in the air, but it wasn't sad. Painfully, bluntly honest, but not sad. Aurora let the word roll in her mind, relishing its plainness. "It doesn't. But- I don't know. You find other reasons to live." A Wicked Thing offers a fascinating new take on Sleeping Beauty fairy tale. It isn't so much a re-telling, as it is a "what-happens-AFTER-happily-ever-after", and I found it not only very original and compelling, but also quite thoughtful and insightful. We all grew up with fairy tales such as Sleeping Beauty, Snow White or Beauty and the Beast. Some of us have read the original versions, some just the milder children's books based on them, most of us have probably seen the movie adaptations too, whether the old school Disney ones, or the modern live-action takes on them. Point is, we are so familiar with them, we rarely stop to consider some aspects of these stories or try to think how they'd translate into real life situations, with real people. And we rarely ever wonder what happens after the last page is turn, the princess is saved, the kingdoms reunited and the perfect couple gets their happy ending. Rhiannon Thomas takes it one step farther. We begin with the moment when Aurora wakes up from her 100-year-old dream to discover she was kissed (saved?) by some prince she never saw before, doesn't know at all, and is now to marry. She discovers that her parents and everyone else she knew is long dead and she's alone (figuratively speaking) in a world full of strangers. Strangers who all want something from her. Kissed by who knows how many strangers over the many years, confused and scared, Aurora finds herself having to decide between her own happiness and doing what's best for the kingdom. I really enjoyed this story. It's a clever and nicely crafted tale of fate, duty, betrayal, intrigue, politics and identity. Aurora has never been more fascinating to me than in Thomas' re-imagining of her story. She's never been more real, more complex and more tragic. I mean, can you even imagine how utterly messed up her life must have been? This girl was completely robbed of free-will. Cursed at birth, locked away in a dark, dusty tower by her own parents (for 18 years! And that didn't help save her in the end!) and then awaken by a total stranger and expected to love and admire her savior for the rest of her life. How sad and creepy is that? How utterly unfair and cruel? She is expected to marry someone she never even saw before, someone who kissed her (and likely groped her) without her consent. Isn't it disturbing? But there is so much more to Aurora than just being a strikingly beautiful but ultimately powerless little princess desperate to be saved by a prince on a white horse. She's a girl with a big heart, bright mind and a head full of dreams and plans. People want to make her a pawn in their game of politics and power, but she is smarter than they think, more powerful and more brave than they imagine. And she doesn't need a prince to make her life complete, she is fully capable of saving herself. I really liked that about her. Aside from prince Rodric (whom Aurora is expected to marry), there are also two other guys fighting for Aurora's attention (possibly affection, too) - the overconfident (to the point of being cocky) prince Finnegan and the mysterious leader of the rebels, Tristan. Not much happens in the romantic department, though. Aurora is a level-headed girl who has her priorities straight, and she doesn't really care much about silly romances - and thank goodness for that! Besides, the guys are interested in her for (mostly) non-romantic reasons, they simply think that she'd make a powerful and influential ally, and they want her on their side. That's another thing I liked about this story! Overall, A Wicked Thing is a wonderful and enthralling fantasy/re-telling. It's more grounded in reality and more believable than most re-tellings I've read so far, mostly due to the fact that Aurora is a more believable character and her actions and decisions are more reasonable, more thoroughly considered, and, therefore, more realistic. I thought it refreshing to be able to connect with her and understand her feelings so profoundly, and I am hoping to see Rhiannon Thomas continue on with this story.